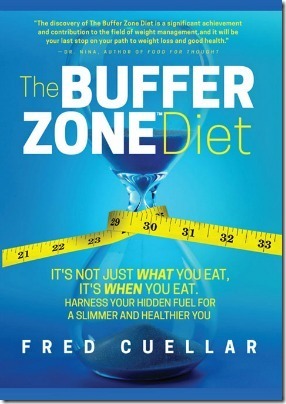 This is a review of The Buffer Zone Diet by Fred Cuellar which is about weight loss and nutrition. Disclosure: I received a copy of this book for review purposes. This post contains affiliate links. If you make a purchase through one of these links I receive a small commission. Subtitle: It’s not just what you eat, it’s when you eat. Harness your hidden fuel for a slimmer and healthier you. Summary: When you’re drowning, the last thing you do before you go unconscious is take a breath. The carbon dioxide rises so much in your blood it overpowers the last few molecules of oxygen in your body. You reach your breaking point, then you inhale. I inhaled food my whole life and I reached my breaking point in my battle with weight loss. Right at the moment I was ready to give up, I had some last thoughts: What if there were things I believed that weren’t true? What if calories in and calories out had exceptions? What if we don’t all metabolize food the same? Why can’t we successfully lose weight and keep it off? I had to find out – my life depended on it. In my quest to break my weight loss code, the Buffer Zone is the space where I found my truth. I don’t normally read weight loss books because I don’t believe in diets. It makes no sense to eat a certain way to lose weight and then go back to “regular” eating and not expect to gain the weight back again. It’s for that reason that I think The Buffer Zone Diet book should consider changing it’s name before the next time it’s published. This book is NOT about a diet, it’s about changing the way you eat forever WITHOUT having say goodbye to your favourite food forever. I usually don’t like when someone tells their life story at the beginning of a book because it honestly usually bores me. Not in this case however. I was interested in Fred’s backstory right from the beginning and as someone who loved working on hard puzzles as a kid and sometimes thinks in different ways I could identify with parts of his life. However you don’t just get the he is smart vibe from his backstory. Throughout the book he spends hours, day or weeks researching related topics and then makes lists from that and then uses himself as a guinea pig to test his theories. I do this to an extent too (the extensive research and lists) but he goes all the way. Fred didn’t just write a book on his thoughts. He did extensive research and tested things out long before telling others what to do. Once you’ve gone through all the parts of the book that explain the science behind everything and you see how the trials went as he tested things out, you will see that this is by no means a quick fix. The main idea behind it is that despite what many think we do not need 3 meals a day plus snacks or 6 small meals a day. Fred uses science to figure out exactly how long it takes our bodies to digest our food and so he knows the time before our bodies TRULY need more fuel. If we want to lose weight than we need to spend some of our time burning the new fuel we put in but we also need to spend some time using up the excess fat we have from previous times we ate. Fred uses science again to figure all of this out. He has spend TONS of time researching every aspect of this and trying things out with himself as a guinea pig to bring you the PLAN that can help you lose weight and keep it off. There are no foods you cannot eat although of course you have to eat more of certain foods and less junk foods but that it less important than when you eat. So if you want ice cream, it’s better to eat it as part of your meal (the end of it) than to finish your meal and then eat your ice cream an hour later for dessert. Of course a self-help book is only good if you follow the advice. Reading the book will not help me lose weight unfortunately. I would like to try the plan and see results but it’s hard work and I don’t know if I can commit to it right now. However there is no question that it works as many have used it. If you have 10 minutes, check out this video by the author with a longer introduction to The Buffer Zone Diet book.